4 Spring 2017 me a different perspective and insight into our Trinitarian God and our global church. For two years I was co-moderator of the special committee studying the Confession of Belhar, as commissioned by the General Assembly of the PC(USA). In June 2016, after many years of struggling with the Confession of Belhar, the commissioners voted (540-33) to approve this South African confession as our own. Belhar recognizes racial segregation as sin and rings true to my experience as a person of mixed racial ethnic heritage, both Latin American and Latinx-American, whose children are a further mix of who I am and their African-American M y call to mission is the result of mission work, mission schools, theological education and the rooting of the Protestant Reformation in Latin America where, since the 15th century, the largest numbers of historically and culturally Roman Catholics have lived. Ours is a religiously pluralistic region where popular religions—and now the fastest growing "nondenominational" Christian movements in the world—coexist with leading theologies of the future, as well as with Christian theologies many centuries old. As a fourth-generation Protestant of the historic churches—an uncommon occurrence in Latin America—I wonder if "mission in reverse" from the global south to the global north is something that needs to happen more? 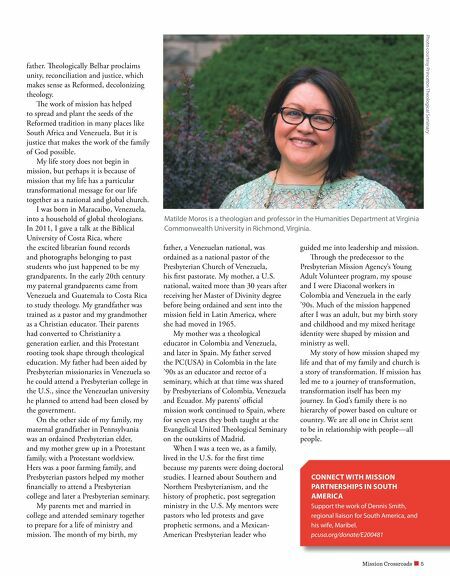 As a person of Latina/Hispanic mixed heritage, I view my transnational identity as a gift and a challenge to the Presbyterian Church. After all, persons like myself represent a growing population in the U.S. By 2050 the church, as well as the national population, will reflect society, regardless of how difficult it may be for a majority white denomination to change. It seems inevitable that the church will require mixed-heritage members in mission service to the church itself. 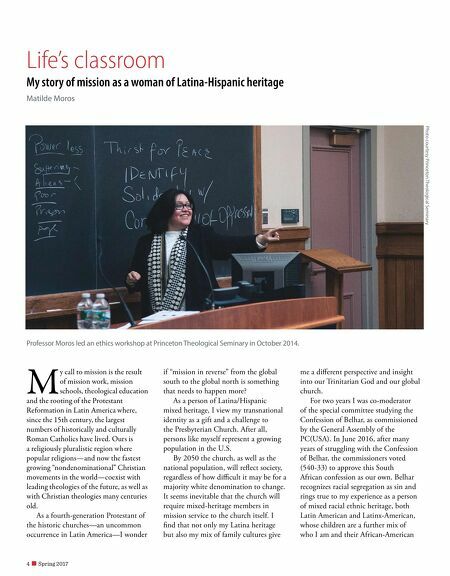 I find that not only my Latina heritage but also my mix of family cultures give Life's classroom My story of mission as a woman of Latina-Hispanic heritage Matilde Moros Photo courtesy Princeton Theological Seminary Professor Moros led an ethics workshop at Princeton Theological Seminary in October 2014.